If Barbera is the straightforward, easy-going charmer of Piedmont’s famed local grapes, Nebbiolo is the ornery intellectual: It may reward lovers with a deeper, more meaningful encounter—but not without a fight. Like Pinot Noir, the thin-skinned grape thrives in cooler climates. It’s often the first to bud and last to ripen, resulting in full-bodied wines with delicate aromas, yet intense tannins and high acidity. In both farming Nebbiolo and experiencing it in the glass, there is nothing easy about this grape. Which is why fickle Nebbiolo is perfect for expressing subtle differences in terroir—especially in the Langhe subregion of Piedmont, where soils and microclimates can differ greatly within a few footsteps. 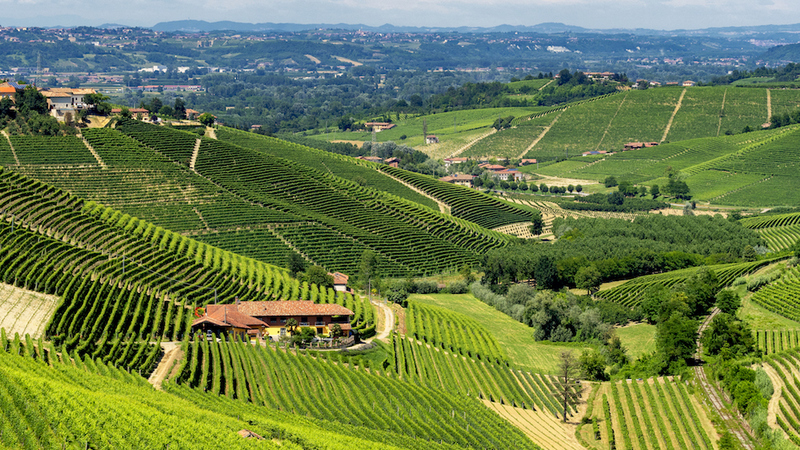 In fact, as in Burgundy, a single Langhe plot might be divided up amongst multiple vineyards. Thus, growing the grape in Barbaresco or Barolo will produce very different wines—even though the two famous DOCGs are only fifteen miles apart. Barbaresco lies closer to the Tanaro River at a lower altitude; with its warmer temperatures, the region harvests its grapes earlier than Barolo. Both regions have soils rich in lime and clay, but Barbaresco has sandier, less compact soils that are richer in nutrients, resulting in fewer tannins, and softer, more approachable wines than the heartier, firmer products of neighboring Barolo. Founded in 1797, is one of the oldest producers in Barbaresco. Like many other producers of the region, the winery owns multiple estates (four, to be exact) where it grows Barbera and various international varieties—but you’ll only find Nebbiolo in the Barbaresco properties. There, three different vineyards (each with varying amounts of clay, blue marl, limestone, and sand) produce three distinct wines. These include the , produced from nearly 30 acres of vines averaging 50 years old on Di Gresy’s flagship plot, Martinenga, one of few in Piemonte. It’s a bright, fruit-forward wine that can be enjoyed young, but demands time to be fully appreciated for its incredible elegance and structure. Meanwhile, their , made with grapes from throughout the region, serves as a beginner’s guide to Nebbiolo: Strong but delicate, with amaro-like aromas, the wine balances sweet with bitter, showcasing menthol, anise, and violet notes amidst the fruit. has been known for quality Barbaresco since 1859, but it wasn’t until over a century later that the winery became iconic as a revolutionary trendsetter. By 1978, Angelo Gaja had begun planting Cabernet Sauvignon; over the next four years, he’d plant Chardonnay and Sauvignon Blanc, too, to much of the region’s shock. Still, Nebbiolo is what put Gaja on the map—and while the winery also produces Barolo, its heart lies in Barbaresco. Their flagship Barbaresco DOCG (sourced from 14 different vineyards) and five single vineyard Nebbiolo-based wines collectively define modern Barbaresco: rich and full-bodied, yet refined, balanced, and undeniably sleek. Thus, it makes sense that their renovated castello in Barbaresco would be a pristine compound, adorned with gorgeous glass and modern art, unlike some of the more traditional wineries of the region. Though long known for its exclusivity, Gaja opened its doors to the public for the first time in 2014, offering tours and tastings to those who donate €300 to one of a handful of preselected local charities (email [email protected] for details). Those who do will taste some of the great wines of the world, comparable to high end Bordeaux or Burgundy in quality and price. In 1964, winemaker Elvio Cogno produced one of the first cru Barolos, from the Brunate vineyard. In 1990, he would break away and found his own in the famed Ravera cru, focusing on single vineyard and single clone wines—a unique approach in the region. Today, by planting each of their individual vineyards with one isolated clone of Nebbiolo (either Lampia, Rosé, or Michet), Cogno’s equally skilled daughter and son-in-law, Nadia Cogno and Valter Fissore, produce wines with incredibly focused profiles. To explore all of their unique nuances with one of the warmest couples in Barolo should be on any bucket list. The winery is also notable for restoring the semi-aromatic Nascetta grape—one of Barolo’s only indigenous white varieties. First produced in 1994, would establish a new official DOC in Cogno’s home of Novello: Langhe Nascetta. Though fresh and bright up front, it has a somewhat savory finish, showing a lot like Riesling as it ages. Produced with no oak or malolactic fermentation, Cogno’s version is an authentic, simple expression of the variety. ’s can be found in Castiglione Falletto, one of three towns—along with Serralunga and La Morra— that make up Barolo, and the only one fully contained within the region. Vietti can also lay claim to owning the most pieces of highly prized vineyards (or “crus”) in Barolo, such as Brunate or Rocche di Castiglione (both of which Vietti uses to produce single vineyard expressions). However, Vietti’s flagship, , is a blend of 11 of some of these best vineyards, and serves as the best introduction to the winery’s style: traditional, with a modern flare and a lighter touch similar to that of Barbaresco. This style is thanks, in part, to longer maceration and older vineyards that produce silkier tannins and brighter cherry flavors – but it also perfectly fits the personality of winemaker Luca Currado Vietti, who—despite his wisdom and complexity—is as modest and gentle as Piedmontese come.